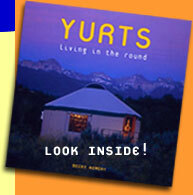 Yurtopia Yurt shirts and more! Mujaan (The Craftsman) A documentary of a Mongolian family building a ger. The Silk Road series (6 vols) See esp. “Where Horses Fly Like the Wind”. The Story of the Weeping Camel Moving tale of a Mongolian family and camel that unfolds around their ger. Wild Horses of Mongolia Julia Roberts rides Mongolian horses and stays in a ger. The Freedom of a Yurt Covers the basics of purchasing and setting up a fabric yurt. Tiny Life Supply Many great resources from solar to wind for off-grid or grid tie situations. Dirt Cheap Builder’s Catalog Good off-grid resources. Boojum Expeditions Travel Mongolia on horseback, stay in gers and meet local Mongolians. Includes resources on Mongolia. Oregon State Parks They were the first. Over 200 yurts in parks and ever-so-popular. Simply Yurts Yurt rentals for London and the South of England. SCA members pursue all things medieval, including annual reenactments and gatherings. They have been researching and building their own “camping” style of yurts for years.